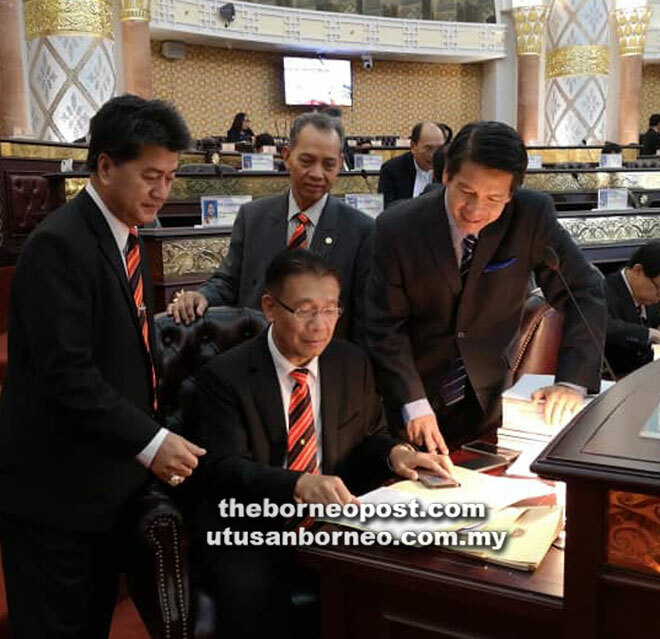 Dennis (right), Marudi assemblyman Datu Dr Penguang Manggil (back, centre) and Beting Maro assemblyman Razaili Gapor discussing matters arising from the State Legislative Assembly (DUN) sitting with Julaihi (seated) yesterday. KUCHING: The construction of Long Lama bridge across Baram river in Long Lama town is progressing smoothly, and is now 87.6 per cent completed ahead of the scheduled 90.2 per cent. According to Assistant Minister of Coastal Road Datuk Julaihi Narawi, the project is fully funded by the Sarawak government at a contract sum of RM67,109,453.37. Julaihi revealed that Jurutera ADDA Sdn Bhd is the project consultant while Pekerjaan Piasau Konkerit Sdn Bhd is the main contractor. As for the contract period, it is from Feb 10, 2016 to Feb 9 next year, for a period of 36 months. “The revised completion date is March 31, 2019 and it is expected to be open to the public in April 2019,” said Julaihi in reply to a query by Telang Usan assemblyman Dennis Ngau during the State Legislative Assembly (DUN) sitting yesterday. Julaihi disclosed that the delay in piling works on Pier 3 (river pier) had held up the project. “Work on the item has been completed and construction is still on schedule to be completed within the contract period,” he emphasised. Meanwhile, he said the proposed Marudi Bridge over Batang Baram in Miri Division had been approved under the Chief Minister’s Walkabout Project. He said the consultant for Marudi Bridge is Jurutera Minsar Consult Sdn Bhd and the project, including the construction of a concrete bridge over 650m and 1.1km approach road, is estimated to cost RM90 million.